Manifestation is the act of bringing something from the world of the unseen to the world of the seen. However, to many that have used the Law of Attraction to manifest success, happiness, money, or health in their life and have seen no results, feel that it does not work. The philosophy behind the law of attraction and the “fundamental truth” that belongs to all human beings. Your role in the Law of Attraction and the actions you need to take to enjoy a more positive and confident life. The origin of the Law of Attraction. The differences between the “personal” and “impersonal” mind. A powerful 3-step process to untap the unlimited power of your mind. The Know-See-Get Technique is intended to help you find clarity of what you want how to get it. The 4-Point Success Generator will help you enhance your business or personal life by achieving greater success. The 3-Step Manifesting Ritual is a clarity technique to help you understand your true desires. A technique to help you stay organized and fulfilled. Methods to help your mindset recharge and lift your emotional and physical batteries. Accompanying the full audio course is a 27-Page Workbook summarizing all the knowledge and exercises. 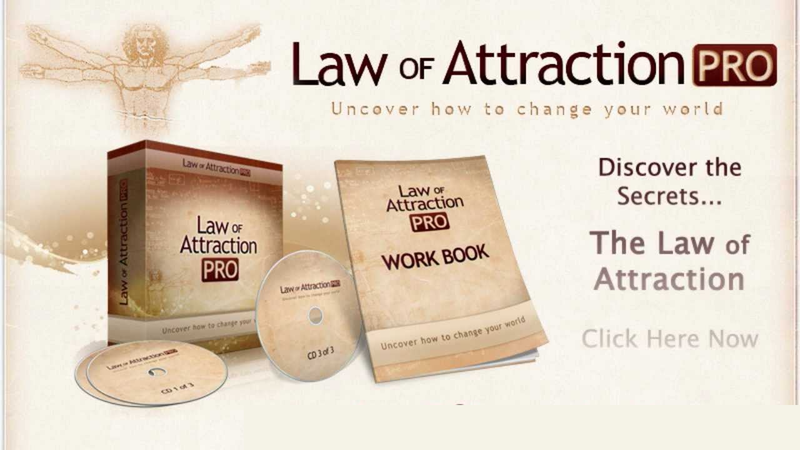 The intention behind Law of Attraction Pro is to bring together the manifestation teachings of the best Law of Attraction teachers into a one simple-to-understand audio package. With 3 CDs, this audio collection is the solution for people wanting to manifest more out of life. Three simple audio CD’s with the teachings of the world’s greatest Law of Attraction teachers. An overview for people new to the Law of Attraction. A plethora of techniques dedicated to helping you manifest your dream life. The latest and most refined methods to help you manifest. Simple short techniques for in-the moment listening. A 27-page workbook covering all the essential principles. No visuals to accompany the audio course can make it difficult to listen to for those that want visual guidance. There are many manifestation techniques and vides on YouTube with some of the same information. Quite expensive for only 3 CDs. The Law of Attraction Pro 3 CD audio course appear to be the perfect blend of information and techniques for people that have a hard time manifesting their desires. For a reduced price of only $117 you receive a jam-packed platinum package of information. This audio course, without question, contains some of the world’s most valuable information in an easy to understand package dedicated to help you manifest abundance, joy, wealth, and your true desires. Regularly, the three audio CDs cost $297, but for this limited period only, you can try out the full course for a mere $117. This comes out to 32 cents per day – a small price to pay for the wealth of knowledge compiled in these videos. Each CD comes equipped with enough information for you to begin your manifestation journey today. The course will enhance your knowledge of the Law of Attraction by understanding its origins and purpose, as well as how you fit into it. Moving onto the second and third CD you will be taking mental action towards manifesting your desires. Move through each technique seamlessly and then chose the ones that resonate with you and practice them more frequently. In no time, you will be manifesting the wealth and happiness you have been desiring for years.